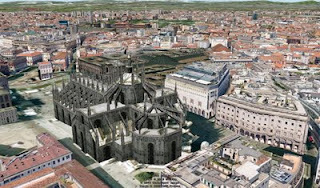 Milan, Italy in 3D is now live on Google Earth! You can take a virtual stroll in via Montenapoleone or watch the city from the top of the Duomo di Milano, walk on the ramparts of the Castello Sforzesco and check out the Stazione Centrale. You can explore these places, and more, in Google Earth. These 3D buildings and landmarks in Milan are primarily comprised of Google-generated models, but also includes some user-created models. Whether you've never been to Milan, are a native curious to explore your city from a unique perspective or anything in between, Milan in 3D offers an incredible opportunity to visit and explore Milan in exciting new ways. As a Google employee on the Geo team and a native of Italy I treasure the opportunity to virtually rekindle my memory of particular locations in Italy as well as plan trips and itineraries for my next visit home. Buon Viaggio! Am I missing something? Italy gets modeled and promoted, but they can't take part in the "Model your Town" competition? Don't mean to raddle any cages here, but something doesn't seem right with that. Info? I can't get it to work on Ubuntu! Awersome work!!! I live in Milan and a dream is now realized! The models and the textures are perfect, trust me!! I see everyday real buildings that are perfectly reproduced in GE. But I see that really few buildings are not present (e.g. my house) wich is the only building not present in the area!! I have the perfect and texturized SketchUp model of the missing builfing (my house), how can I send it to GE staff??? Thank you very very much for your job, il would be an honour contribute just a little building a piece of my city! !